Ok now that’s one of our absolutely favorite decorations for a kids birthday party. 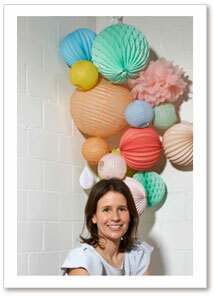 Such a cute backdrop made of paper lanterns and pompoms and hung on the wall like a big colorful cloud. A dream to add some WOW to any event, from a baby shower to a bridal party.